Garmarna is a Swedish folk-rock band. 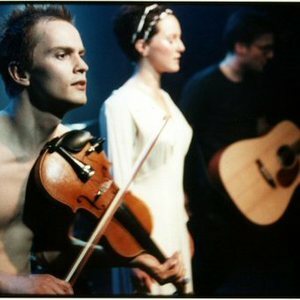 Formed in 1990 in Sundsvall, Sweden, as a trio featuring Gotte Ringqvist, Stefan Brisland-Ferner, and Rickard Westman, Garmarna was inspired by Olov Johansson's musical score for a production of Shakespeare's Hamlet. Their debut album, Vittrad ("Withered"), released in April 1994, was nominated for a Swedish Grammy. The original trio was soon augmented by percussionist Jens H&ouml;glin and singer Emma H&auml;rdelin. In 1996 the band released their second album, Guds Spelem?n ("The fiddlers of God") which received the Swedish Grammy award as Album of the Year. Formed in 1990 in Sundsvall, Sweden, as a trio featuring Gotte Ringqvist, Stefan Brisland-Ferner, and Rickard Westman, Garmarna was inspired by Olov Johansson's musical score for a production of Shakespeare's Hamlet. Their debut album, Vittrad ("Withered"), released in April 1994, was nominated for a Swedish Grammy. The original trio was soon augmented by percussionist Jens H&ouml;glin and singer Emma H&auml;rdelin. In 1996 the band released their second album, Guds Spelem?n ("The fiddlers of God") which received the Swedish Grammy award as Album of the Year. Since then, Garmarna has published three more albums: Vederg?llningen ("Vengeance") in 1999, Hildegard von Bingen in 2001 and in 2003, Garmarna, a re-release of the 1993 EP with 6 bonus tracks.